"People constantly describe me as a formalist or even a minimalist, but I'm not really bothered with the rules of painting or the history of painting. My approach is that everything is mine. I take what I can use from wherever, and then I forget where I've taken it from. But there is no point me making anything that looks like anyone else's." "One drawing demands to become a painting, so I start to work on that, and then the painting might demand something else. Then the painting might say, 'I want a companion, and the companion should be like this,' so I have to find that, either by drawing it myself or locating the image." "I don't make political work. I don't make work that criticises the state. I make as human work as I can." "It's not part of my ambition to become fabulously rich. My plan was always to make my pictures, and hopefully people would buy them, and then I'd buy a studio, buy a house, help friends out, do bits and bobs - but I've no idea after that." "I want to paint something that's gorgeous, something that's perfect. So that it's full of sadness." "I'd like to give people leaden boots in galleries, so they'd be a bit slower in front of my paintings. And that's because I spend so much time looking at them. I can look at them a long, long time without getting bored. I disappear." "I like things that are just about to go. Everything's leaving. Death is never far away from me. When you make something, death can't help but be in it." "If I'm feeling desperate, I'll go out image-hunting. I'll go to news agents and stand at the rack flicking through magazines or go to second-hand bookshops. And then, bit by bit, like concrete poetry, I start to realise that I am drawn to particular things, and then I start wondering why that is." "Small paintings can be fantastic. But you can't often get a narrative out of a small painting. In any case, museums are huge places, and you want to take up some space." "I'm more and more fascinated in my own work. I work from 10 A.M. until about 9 P.M., but it's not an obsession, it's a pleasure. There's never enough time." "Sometimes I can see the whole painting from the outset in my mind's eye. But more often than not, that idea doesn't last the duration of the painting. Sometimes it comes out easy, just as I had envisaged. But that is reasonably rare." "The door paintings ... they aren't really a door, they are a couple meeting in a hospital corridor, knowing that one of them is going to die." "Line and colour are crucial." "Sometimes if I run out of colour I will go into a litter bin and grab the litter and then go and make all those colours." "I wanted to make a painting love light - I don't paint light, I don't do light effects, but I want it." "But ... in the end it's what the painting looks like ... I'm a slave to it." "It's the great pleasure and pain of life that you really are stuck as yourself and however much you wish you were capable of making someone else's work, you can't. So you don't." Hume only met his father once as an adult, and the two never formed a relationship. He said of his father, "He just went off. He had whole tribes of families all over the place ... he was a criminal. A con man." Instead he continued to develop his close bond to his mother, one founded on respect and admiration and which has continued into his adult years. Hume attended Homewood School in Tenterden, but left at 16 with no formal qualifications. On tentatively deciding to work in film he went door-to-door around London's Soho until he finally found employment as an assistant film editor, but did not stay long after realising, "I couldn't really work with anyone. I knew my ideas were better." He struggled to find his place for the next few years, living on unemployment benefits and taking on short-term labouring jobs, where he learnt precision skills that would feed into his later paintings. At age 20 he experienced a revelation when he started attending life drawing classes in Camden and discovered not only an ability to draw but a passion to make art, which he funded by posing as a live model. He said, "My desire to be an artist really came out of being broke and unemployed and incapable of holding a job down. That's what it was driven by for sure." On deciding to pursue art full-time Hume spent two years on a day course in London earning enough academic qualifications to go to college, before receiving a grant to study art at Liverpool Polytechnic in 1984. During this time Hume's former girlfriend gave birth to his son in London and he was determined to be there for his child, so he arranged a transfer to study at Goldsmiths in London citing "personal reasons." 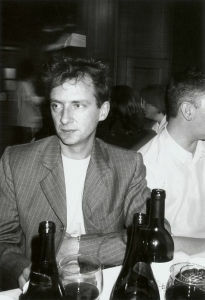 Moving to study at Goldsmiths in 1985 was a breakthrough for Hume, as it was the time where he found his purpose as an artist and a group of peers to support his activities. He was taught at the institution by Michael Craig-Martin, who told his students that "anything goes", and insisted that Hume and his fellow undergraduates see themselves as artists, not students. This professionalism set them on an early path to success. Amongst his fellow students were Damien Hirst, Mat Collishaw and Sarah Lucas, founding members of the highly influential Young British Artists movement. Despite the attraction of the intellectual freedoms at Goldsmiths Hume struggled financially, recalling, "I lived on nothing for years - squatted where I lived and where I worked, stole electricity, made things from stuff I found in skips, used paper that had been discarded - you do everything you can do to keep going and not have to get a job." While a student he experimented with a range of derivative styles influenced by various artists including Andy Warhol and Joseph Beuys. Hume was in a relationship with Lucas for 7 years and she remembers him vividly as a student, "He was easily the least self-conscious person there. He started working in his studio oblivious to what anyone else was doing. I remember seeing these exploding glass panels of blood, and thinking, 'Well, he's a relief.'" At Goldsmiths Hume was torn between his conflicting interest in Donald Judd's polished Minimalism and Julian Schnabel's more emotive Neo-Expressionism. He eventually found a middle ground with his door paintings, images which combined the geometric patterns of hospital doors with narrative content revealed through their titles. They were painted with industrially produced, household gloss paint, for which Hume says, "I found that gloss paint suited me entirely, and its qualities still intrigue me. It's viscous and fluid and feels like a pool. It's highly reflective, which means there are layers of looking. You look at the picture, and you look at the surface, then you look at the reflection in the surface behind you, then you look at yourself." 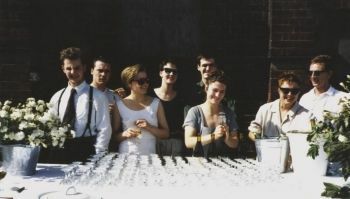 On graduating in 1988 Hume took part in the iconic Freeze exhibition with a group of his Goldsmiths friends including Sarah Lucas, Mat Collishaw, Angus Fairhurst and Damien Hirst. Orchestrated by Hirst, the show took place in an empty London Port Authority building in London's Docklands and attracted significant attention, an event that was instrumental in the development of the YBA movement. The doors Hume exhibited in Freeze led to almost instant success; London art dealer Charles Saatchi bought a series and commissioned another four, and a series of solo exhibitions and private sales in London followed. The success Hume and his fellow YBAs found at such an early age was unprecedented. It brought with it money and fame, and many of the YBAs became notorious for their wild, reckless partying. But Hume remained at a slight distance from these activities due to his commitment to his young son. His unwavering determination to be a painter also set him apart from many in the group, who experimented with unconventional materials and deliberately shocking subject matter. 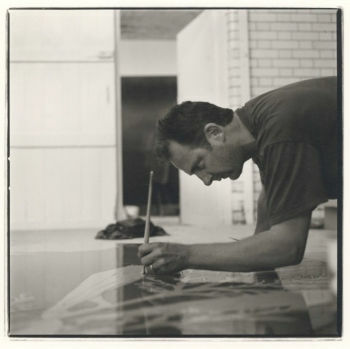 Between 1988 and 1992 Hume focussed almost exclusively on painting door patterns. Although he garnered commercial and critical success, he felt increasingly restricted by the limitations he imposed on himself. In 1992, halfway through a door painting he stopped, realising he could not finish it. He said on reflection, "I didn't really have any choice but to stop. It would have been braver to have carried on with the doors and be bored for the rest of my life for the sake of a few quid ... you'd have to have given up passion and the desire to create to become a slave." During this time Hume was living with fellow artist Sarah Lucas, who was receiving international praise for her gritty, honest works and Hume seemed to feel the need to channel the same authenticity into his own. Karsten Schubert, Hume's dealer in London was unimpressed with the new work Hume initially tried to promote, describing it as, "figurative work with lots of paintings of Madonnas and rather hideous wire mesh sculptures." The two ended their working relationship and Schubert recalled, "It took him two years to pull it all together. It was a very brave and anxious moment when he took that radical step." Hume's crisis over his new direction reached a peak when he filmed himself sitting in the bathtub titled Me as King Cnut in 1994, sitting fully dressed in a bath tub wearing a Burger King crown. The title was a play on the tale of King Canute, remembered conversely as both a joker and a sage. Hume likened himself to the King, saying, "I felt either I'm a total fool to do this, or I'm wise." 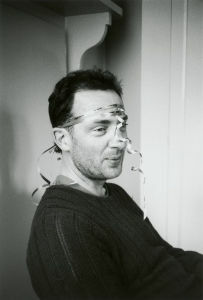 In 1995 Hume exhibited his new work for the first time in a solo exhibition at the Kunsthalle in Berne, to great acclaim. New York dealer Matthew Marks said, "Someone bought a painting for £6000. I was totally shocked; it was the first time anyone had bought one of the paintings in his new style. I thought 'Oh my God, that's it'." The paintings revealed a range of semi-representational motifs, painted in a distinctive, graphic style that has been likened to work by many of his contemporaries including Julian Opie, Patrick Caulfield, and Alex Katz. Reminiscent of some work by Andy Warhol, everyday pop imagery came to the fore but was interpreted through a more abstract, Minimalist visual language. In the following years Hume met and married the artist Georgie Hopton and the two established a home in Hoxton in London, where his son would often stay. 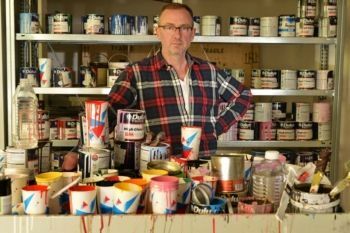 In 1996 he was shortlisted for the Turner Prize, he won the Jerwood Painting Prize in 1997 and represented Britain at the Venice Biennale in 1999. In 2001 he was elected a member of the Royal Academy in London. By the late 1990s Hume had firmly established his career as an artist in Europe and The United States, earning enough money from the sale of paintings to set up a second home in upstate New York. He currently spends time in his second home for about a third of the year, where he and his wife live and work and the rest of the time in his home in Hoxton, London. Living in a new country had a marked effect on the material Hume imbedded into his paintings. The American landscape has proved influential, and he spends time doing what he calls "slow walks" where he can stop, wait and look around, then walk a bit more, searching for material to abstract. He is fascinated by the overwhelming wilderness saying, "it really is indifferent to my existence - it just does not care." In the United States Hume is also fascinated by the culture surrounding cheerleaders, considering their roles as sexual objects, prizes, trophies and athletic, abstract shapes. Although predominantly a painter, he has created a series of cheerleader-related sculptures using found elements and shop mannequins, as well as a series of prints in various techniques. Hume's mother's health began to deteriorate, a subject he has explored in his recent Mum series. In painting his mother's struggles with dementia alongside scenes recollected from his own childhood he reveals a new sense of intimacy not previously as apparent in his earlier works. In 2012, Hume was reunited with several old acquaintances when he was invited to design a poster for the London Paralympics, along with his contemporaries Michael Craig-Martin, Tracey Emin and Bob and Roberta Smith. Hume continues to live and work between London and New York today and is represented by Matthew Marks Gallery in New York. He views his work as an ongoing process of development and discovery as he explains, "I'm probably not going to develop to a final state as an artist. Like, become better and better, more and more refined. Become 'pure.' I don't think that's going to happen to me, because I don't really see that as something I want to explore." 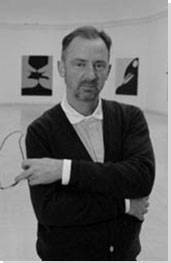 Gary Hume is recognized today as a key figure in the YBA (Young British Art) movement that emerged in the 1990s in London. Like many of his fellow YBAs, Hume integrated aspects of ordinary life into his artworks with an anti-establishment, rebel spirit that breathed new life into the then floundering British art scene. In regular pop-up exhibitions they developed a savvy business model, raising high market prices for their artworks and leading to the emergence of a whole series of contemporary art galleries including Victoria Miro, Sadie Coles and White Cube, many of which are still important to the London arts scene today. 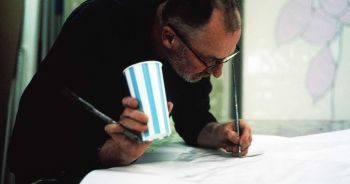 Writer Dave Hickey has likened Hume's paintings to those of Alex Katz, Patrick Caulfield, Ellsworth Kelly, Kenny Prince and Jack Wesley, "an elite group" who are "abstractionists of everyday life", or artists who nod towards the spare simplicity of Minimalism while turning their heads back again to focus on the stuff in their daily lives. Hickey wrote, "All of their work retains some residual signifier of quotidian existence as a mark of courtesy, as a sign of its willingness to play well with others." Hume continued to make paintings at a time when other mediums were more fashionable, blazing the way for the next generation to explore a Post-minimalist language in two dimensions. Chantal Joffe's figurative paintings of women share Hume's simplified language and closely cropped compositions while Tony Swain's paintings exist in the same in-between space as Hume's, where real objects begin to dissolve into abstract shape and pattern, leaving only a trace of their true identity. Tomma Abts' abstract paintings are even more indecipherable, though they share the same penchant for unusual colors and areas of raised, textured paint, to remind the viewer that they are still objects as well as pictures. Hume's alternative use of household paints has also shifted contemporary attitudes towards painting and diverse artists have pursued experimental techniques, from Peter Doig's expressive landscapes that layer glossy household paints over oil, to Inka Essenhigh's cartoon-like language that merges the matt surface of oil with the patent sheen of enamel. In this work two upright painted panels sit side by side. One is red, the other an off-white shade of magnolia. Each is painted with a high gloss finish, reflecting the room around them and the viewers looking at the work, and are decorated with geometric shapes and two dark circles resembling round windows into another space, or a pair of eyes looking back at the viewer.